Whew, well, it finally happened last week. I recorded a short segment on the Trail Show about the Florida Trail with the crew on The Trail Show! I was very nervous about it but thankfully my nerves were eased by a: it was a phone Skype call and not video and b: the ease in which they had their questions lined up. They are excellent interviewers! I actually haven’t listened to the episode yet, mostly because I’m not interested in listening to myself. However, Chris listened to it and said it was great. I’m not sure where exactly my part comes in at. You can either scroll through and listen for me or I suggest just listening to the whole episode anyway. And then go back and listen to all of their other podcasts for trail insight and humor—with some beer talk. I couldn’t help them out on any local Florida brews, but Suwannee Refugee pointed me in the direction of a map of local breweries. Anyway, I know I didn’t cover some questions that some hiker friends asked me on Facebook so I thought I’d cover them here for everyone else to read too. + What season to hike it? 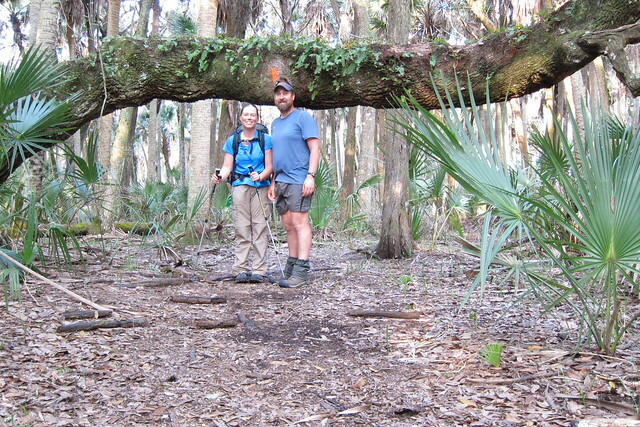 You’ll want to hike the Florida Trail during the winter/dry season. Most people start sometime in early to mid-January but some start in December and I’ve seen folks start it in February. Starting too early in December might get you with more water down in Big Cypress if it hasn’t had a chance to dry up yet. February risks you running into April which starts getting warmer, buggier, and drier—which can be a problem finding water in some areas. + Any really great sections that can be done in a week-long trip? On the show I mentioned the Suwannee River section and Ocala National Forest, but really there are more sections than that I could recommend. I think stringing together the Aucilla Wildlife Management Area, St. Marks National Wildlife Refuge and Apalachicola National Wildlife Refuge would be a really excellent week long to 10 days section. + Trail community? Kind of. Yes, there are definitely some strong, local FTA chapters. But it isn’t necessarily like the AT or even the PCT in regards to a trail community in regards to thru-hikers. It’s a small group of FT thru-hikers! There are some trail angels and big time FT volunteers that are around during thru-hiker season, but not all FT chapters are as involved in thru-hiker season as you might see on the AT. It’s there, you just gotta find it. Matt: Length, difficulty, flora, fauna, water special spots, and history. I think I covered the majority of the questions Matt asked, but I think maybe the only thing I didn’t was the difficulty. In comparison to mountainous trails, it is flat and easy walking. But, the road and levee walking can beat your feet up pretty badly. It isn’t easy—it is long distance hiking, but it isn’t up and down climbs every day. Chel: How do you even get started? + This could have two meanings…getting to the trail head and any special permits/information. First, go to the FTA’s long distance hiker resource page and read through the links there and be sure to get the permits for the sections that require it (Seminole reservation, Eglin AFB). The other part, how to get to the trail head…well, if you start in Big Cypress it is 70+ miles west of Miami. In the middle of nowhere. 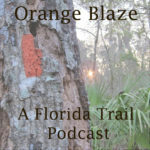 You’ll likely want to talk to the FTA and get their trail angel list (only given to you once you fill out the paperwork for the Florida Trail), or find connections on White Blaze to get you to the trail head. It would work the same way if you wanted to start up north in Pensacola at Fort Pickens on Gulf Islands National Seashore. We lucked out in that we knew people in south Florida since we’d lived there for 8 years and then Chris’ dad and step-mom picked us up at the end. +Trail conditions.. How much wading through water, how much road walking, how much shade, sun and rain? In a normal year there isn’t all that much wading in water. Yes, there is some in Big Cypress and the other big section would be Bradwell Bay in Apalachicola National Forest, but here and there you’ll run into areas of water that are relatively short to get through. It depends on recent rainfall usually. There are annoying areas on some forest logging roads, some wetlands you’ll skirt, but it really won’t affect your daily mileage, those parts. Big Cypress and Bradwell Bay will. Think of them as The Whites or Mahoosuc Notch…you just plan to be slower on those areas. As for roadwalking, it is estimated to be less than 300 miles. They are scattered about with the majority of them being in the Panhandle. Shade: In forested areas yes. Scrubby areas can be more open. Sun: Definitely more sun on the roadwalks and levees, but it will be winter so the sun isn’t so unbearable. Rain: During an average year there shouldn’t be too much rain. We ran into some rain in north Florida with only one really miserable day, but for the most part it is sunny and wonderful. This year is not a good year to be watching—those hikers have had a wet winter! + How many scary creatures are there!? I’d say your scariest creatures will be snakes. Yes, Florida has alligators but generally they are going to be in canals, streams and deeper waterbodies. You *could* run into them in some deeper swamp areas, but generally not. A good plant to keep an eye our for in swampy areas would be Alligator flag…because it will be in the deepest section of the ponded area. Stay out of that area if possible. Otherwise you can run into bears, primarily in Ocala or Osceola National Forests, and even more rare would be a Florida panther down in Big Cypress. You could keep in mind on the panthers that there has never been a documented case of a panther attacking a human in Florida…so I’d still be more cautious of snakes. +How often are you forced to stay in town because camping isn’t possible? I think the only time this might be a problem is walking through Orlando. We did see a couple of places one could stealth camp, but really, just get a hotel in Lake Mary, it will be worth it. +Any special gear required? Not really. Just have some camp shoes that double as water shoes. Something that will stay on your heel if the water is low and the terrain is more muddy in Big Cypress. +Where do I get maps or how otherwise do you follow the trail? You can get maps from the FTA and there is a thru-hiker packet. Definitely get it! However, there is also a new guidebook out from Sandra Friend. Definitely get it too. +Planning your resupply points. Any weird resupply logistics? Using the guidebook will help you plan your resupplies but you really don’t need too many mail drops. We had three: the 88 store in Ocala NF, White Springs, and Ebro. White Springs and Ebro don’t have grocery stores but White Springs did have gas stations and a Dollar General. Ebro only had a gas station. Check with the guidebook for updates. The weird logistics that we had to deal with was between Okeechobee and Christmas. There’s a very big stretch where towns are not anywhere near the trail. There are road crossings but no easy resupply. The only potential option is River Ranch, which has a ‘general store’ with not really backpacker friendly items. It is an option, though. River Ranch does have a post office, so a maildrop there might be an option. We had a friend meet us to deliver a box just after the Three Lakes Wildlife Management Area. He also met us back at the Seminole Reservation, which is another tricky area. The trail has been rerouted there since we hiked and now passes a gas station, which would probably get you the two to three days to Clewiston and a grocery store. Other than that I don’t think there were any other particularly tricky areas. Hitching or Trail Angels will be your best bet for the tricky areas. +Will I get a free patch like for the AT or LT when I’m done? Yes, and a bandana! At least, we got that in 2011. +Will I run into many annoying day hikers? Only in a few popular areas. You’re more likely to run into fishermen or hunters. Don’t worry, they are usually friendly! +Will they fawn over me and give me food? Hah! No. What, you think this is, the AT? You might get some questions but they generally have no clue what thru-hiking entails. +What makes this trial unique amongst all the other trails out there? It’s flat! And there’s sub-tropical landscapes in the mix, including a lot of unique ecosystems that are in danger of extinction due to encroaching development. You won’t see many habitats in Florida anywhere else in the U.S.
+How bad are the bugs/lizards, really? Not bad. Don’t hike in July unless you want the mosquitoes to carry you away. That wraps up the questions…if you have more, feel free to ask them! Listen to the podcast, too! Now, go hike the trail next winter! I haven’t had a chance to listen yet. That is awesome! You rock! Finally listened to this episode and I must say, you did an awesome job! Your descriptions definitely sold me on the FT. Way to go! And thanks for answering all the questions and providing such helpful information.